For Human Allergies. Given to your Dog or Cat. Boulder, CO, February 22, 2018 --(PR.com)-- Pet Allergen Reducer is pleased to announce the launch of their new product. Certain dog breeds are described as being hypoallergenic on the basis of personal reports that these dogs are better tolerated by people with allergies. This assumption is attributed to less shedding as hair is thought to be the main aggravator of allergy symptoms. Pet Allergen Reducer is a first of its kind all natural supplement that reduces the Can f 1 protein in your dog’s saliva, and Fel d 1 protein in your cats saliva and skin. Can f1 and Fel d1 are proteins, known as allergens, that cause your allergy symptoms. When your pets groom themselves these proteins make their way into your environment and cause you to have allergy symptoms. 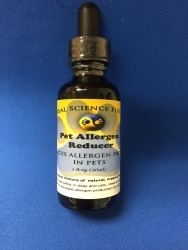 Pet Allergen Reducer has created a product that reduces these allergens by as much as 75%. This product can be used for all dogs and cats. All ingredients are safe, natural, and meet GRAS standards. All it takes is 1 dose a day, given to your dog or cat in their food or a treat.